I've been asked how to cook crab legs and I've got together some resources to show you the different ways of cooking crab legs. Crabs come in all sizes and some people really only like the white meat, not being keen on the brown meat inside the shell. The majority of crab legs that you'll buy to eat will be the giant Alaskan King Crabs or Alaskan Snow Crabs, that are used for their leg meat, not their shell meat. These crabs will be processed before you get them. They are enormous creatures, caught in the Bering Sea and you're highly unlikely to see a live one in your supermarket or fishmongers. They do get shipped live by air, to Asia and some restaurants, but overall, the cost of freight makes it that they're processed and transported already cooked and generally frozen. So, what you'll be dealing with, is how to cook crab legs by re-heating and in the case of Alaskan King and Snow Crabs, you'll be getting all white meat. Read on to find out how to cook crab legs and at the end, I'll give you some tips when selecting where to buy crab legs from. 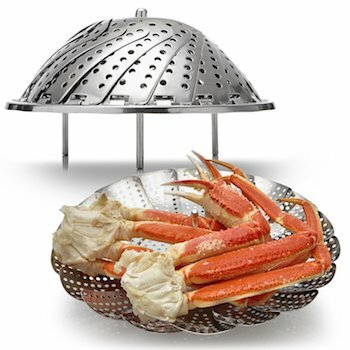 The most common way to cook crab legs is to steam them - for that you need a steamer (oh yes you do!) but of course you could put together something with a pan and a metal sieve/colander. The crab legs are extremely large though, so if you're going to make them often for a few people, you might need to invest in a large pot. They can weigh up to a pound each and one is a good portion per person. You will most likely have them frozen and it is important to defrost fully before you start to cook them. If you don't you'll end up with tough, tasteless meat. These crab legs are not cheap and you'll want to get a really good result when you cook them. So take them out of the freezer the night before and let them thaw in the refrigerator. A precis of this as it's a bit quick. You get all the information you need on how to cook crab legs - you just might not have time to write it down! The next video shows you how to break down crab legs if you want to serve smaller pieces instead of a whole leg per person. He throws away the tips of the legs but I recommend you keep them and use the shells as the basis of a bisque - seriously, the flavor comes from the shell and you'll get a double use out of these legs! You'll also get a tiny bit of meat from the leg tips which will be just enough. Check out this recipe for frugal seafood bisque - you'll never throw another shell away again. Lobster, shrimp and crab shells can all be used to make the base for the bisque, with no need for any meat or just a tiny bit to sprinkle into the bowls before serving. 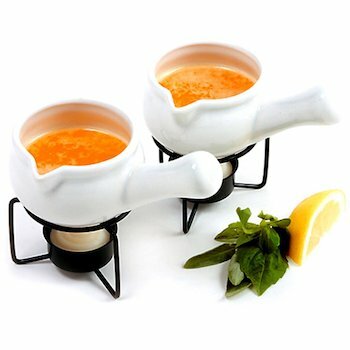 This pair of warmers would be lovely to keep the butter warm and dip your cooked crab meat into. If you watch the video above 'How to Cook Crab Legs Four Ways' Tony refers to using a flavored butter to dip your crab legs into. If you don't want to invest in these, then I'm sure you could rig something up with a trivet, a ceramic dish and a tea light. Don't leave it unattended though for risk of fire. Available at Amazon.com click on the photo. This is the Old Bay Seasoning that Tony talks about in his video. As you can see from the ingredients label, it's celery salt, red and black pepper and paprika. I expect it wouldn't be too hard to get hold of these ingredients separately, but you might struggle to get the proportions right. If you're spending money on your crab legs, then it would be penny pinching if you really like the flavor. How to Cook Crab Legs - what equipment will I need? Let's have a look at steamers. If you're only going to cook legs once or twice a year, then to buy a dedicated crab steamer would be a bit extravagant - financially and in the space it will take up in your kitchen. I see two options here - a stock pot with a steamer or a general purpose steamer. 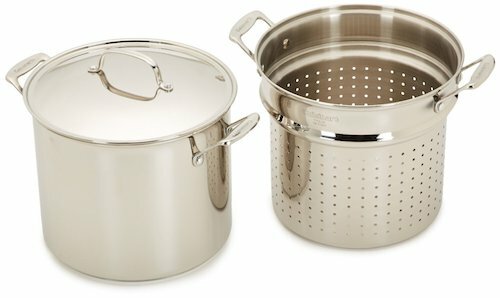 If you've already got a large pot, such as a stock pot with a lid, then the steamer basket would be fine - you'll need to have a lid big enough to keep the steam in the pot. Here's some options from Amazon.com again - if you don't like these, then our friend Amazon will provide you with some related suggestions. Shop around for price, don't forget to compare prices with added postage, you can sometimes spend more than you want to if you don't check the shipping costs. This steamer has good long legs and a long central pole with a ring on the end. This means you can flick it up before you start cooking and then you'll be able to use some long handled kitchen utensil to hook into the ring when you're ready to lift out. It'll keep your hands well away from the steam, which will scald you just as surely as putting your hand in the boiling water. The long legs mean that you can use more water in the bottom of the pot, so when you're using it for veggies or something else, you won't need to keep topping up so often. If I were shopping to buy a pot today, I would buy this one. It's Cuisinart, which is a reliable, solid make and mid price range, all good there. What this has is a pasta basket (it's the insert that you can see inside the larger pot) as well as a steamer. This pasta basket would be useable as a crab leg boiler. The steamer has handles that you can hook into when you're removing the basket. The insert and stock pot have large handles that are well away from the sides, meaning you're not going to burn your knuckles. The lid fits snugly and also has a good shaped handle. This is a 12 quart pot, so not as big as some, but is more than adequate. You can use the pasta insert for frying and boiling other foods, fish, chicken, clams anything you like. The steamer basket can be used for veggies, meat, mussels, shrimp and fish. You could cook your pasta in the insert and put your steamer on top, meaning you save money on fuel and space on your stove top. The big outer pot can double up to cook lobster, crab, stock, soups, batch cook for freezing - cook corn, stew apples, the uses are endless. This is a "GOOD BUY" and has nearly 500 reviews - 79% of them five star and 15% four star. 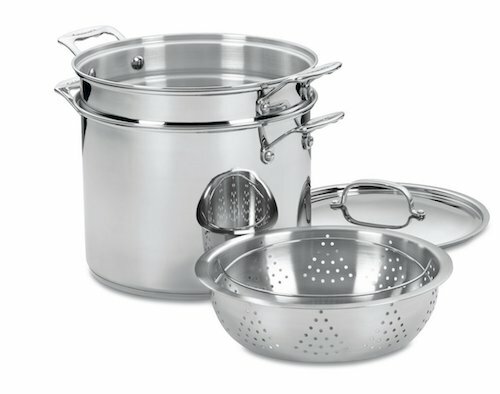 As always, there are some 1 stars - one's complaining about paying for overnight shipping which didn't happen, but says that his wife loves the pot; one that it was a wedding gift and couldn't be sent in plain wrapping; one that it's 'huge' - er yes, it's a 12 quart pot; one that it won't work on induction stoves, but it never claimed to; two others commenting on the steel. You get the drift - buyer's mistakes and blaming the product. I would not take much notice of these at all, apart to store them away in my head to marvel at how people are prepared to destroy a good firm's reputation. So this would be my number one choice - there are pots three or four times the price of this one but I wouldn't bother unless I was concerned about co-ordinating color. 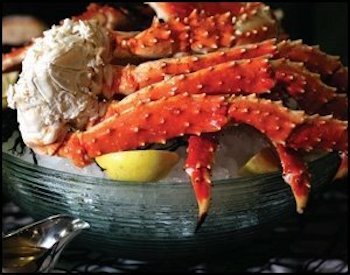 If you want to buy Alaskan King Crab Legs, you can use Amazon.com to compare prices and customer reviews. 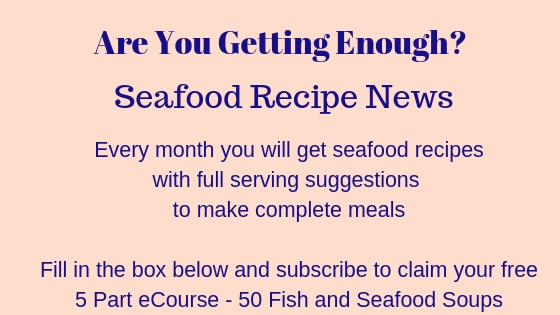 This is a market place for all and many seafood suppliers are now using Amazon to advertise. Unless you've got a recommendation from somebody, then buying mail order can be a minefield. Check the good and bad reviews - the response from the suppliers to a bad review can tell you just as much as glowing customer reviews. Sort the reviews into most recent - companies have good times and bad times, you'll want the most recent reviews to show you where they're at when you're thinking of buying. It could be a change of management, a change of their supplier, all sorts of things can affect the supply chain, particularly with food. Click on the photo below which will take you to a page advertising Alaskan King Crab Legs (Giovanni's which are very good suppliers overall) from there click around until you find a supplier you're happy with.